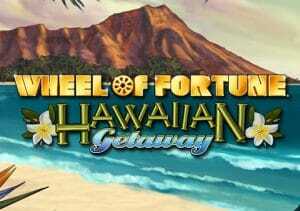 Say aloha to Wheel of Fortune Hawaiian Gateway, a video based on the popular TV gameshow from IGT. This latest instalment is a 5 reel, 50 payline game that comes with plenty of extras including respins with multipliers, free spins, jackpots and course spin the wheel features. Playable on all devices, stakes range from between 50p and £250 per spin. There’s a retro feel to the design in Hawaiian Gateway. With palm trees and beautiful seas in the background, you’ll see royal values garlanded by flowers as well as a collection of 1950s poster images. There are plenty of extras to discover in this tropical paradise. Big Kahuna Respin feature – this is triggered by landing 3 full stacks of the higher value symbols on adjacent reels. After the original payout, the reels will spin again. Only 1 higher value symbol is present on that respin. Any wins from that respin are boosted by a random multiplier of 2x, 3x, 4x or 5x. Pointer Frenzy feature – 2 to 6 extra pointers are added to the wheel meaning you can win multiple prizes as well as triggering the Jackpot Bonus or Free Spins Bonus features. Jackpot Bonus feature – o offer here are 5 potential jackpot prizes. The best of them is the gold bonus which pays 1,000 times your bet! Free Spins Bonus feature – land this round and you’ll receive 10 free spins. Landing 6 bonus symbols on the same free spin results in a retrigger with up to 120 free spins possible. The Big Kahuna Respin feature can also trigger meaning plenty of respins with multipliers up to 5x. We’ve not always been impressed with the design IGT’s online video slots. Too often they look a bit cluttered. We’ve no complaints here though. The old school design works really well, accompanied by a classic Hawaiian-style backing track. The range of features is pretty solid too. There’s a nice variety of extras on offer and the jackpots can deliver a big payout punch. The variance here is in the medium range which offers a balance of payouts. The Wheel of Fortune video slot franchise hasn’t been one of our favourites. Wheel of Fortune Hawaiian Gateway is probably the best of the bunch. It looks and sounds great and the gameplay impresses making this Pacific trip one that’s well worth making. If you fancy heading to Hawaii though, NetEnt’s Aloha! Cluster Pays should do the trick.